The owner of The Powderpuff Girls is a very close friend of mine. We have been the best of friends for 13 years since we met at college and I have been with her every step of the way through her journey with the powderpuff girls so when she came to me with the idea of updating the branding I was so over excited. We wanted to keep a touch of the vintage vibe as the girls have their uniforms which are gorgeous and of course we had to stick with pink but we wanted to make it more accessible to potential clients that were looking for modern styles. I love the bulbs around old beauty mirrors - the ones that you see in old movies so I drew inspiration from that with the dotted border along with a delicate watercolour stroke behind it, to symbolise a blush or make up stroke. 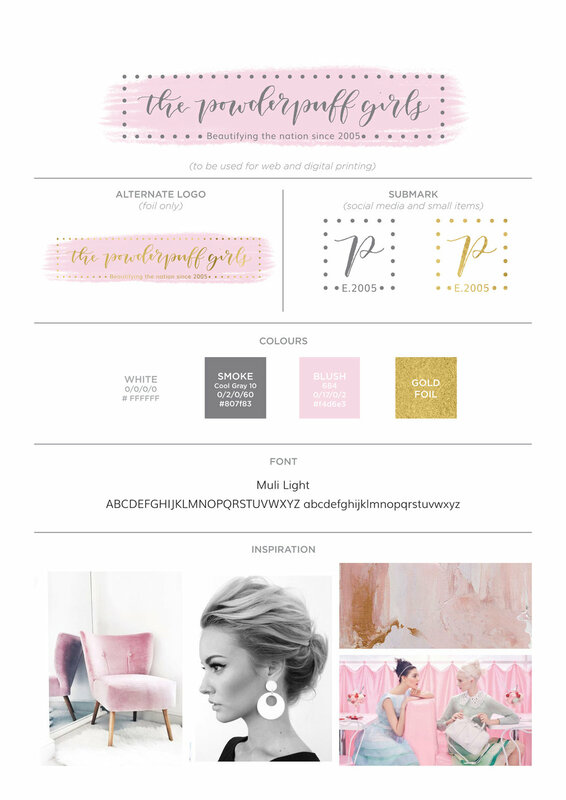 All in all I love the new look for the powderpuff girls and if you are looking to get your hair or make up done for your wedding or an event then you can find out more about them here!